Posted by santos. This entry was posted on 20061025 at 9:38 PM You can skip to the end and leave a response. reminds me of morcon/ embutido with the eggy. or meatloaf with eggy. I've never heard of this before...thank you for featuring it. The Indonesians have something similar they call bakso. Gravy would be nice...as would some (unfortunately named) brown sauce. Oh, scotch eggs! They look delicious. I love them, but I've only ever eaten them in the UK. I like to put ketchup on them. Oh my god I have not commented in your blog in A MILLION YEARS, WHYY!?!? I've never had a scotch egg. I think I'm too lazy to make one though. Or 6 rather. But your's looks and sounds damn tasty. michelle, i don't know, it seems positively healthy compared to a deep-fried mars bar! acornbud, there's always gravy! i'll have to make a bento just for you. tokyoastrogirl, try one! but a good one, first. a bad one really might make you keel over. ana, it totally looks like a mini-embutido to me, too. mita, do you know how the bakso is made? shukumei, you should try HP sauce, very tasty. robyn, i don't know WHYYYYYYYYYYY???? i might just have to lob these at your head IF YOU DON'T STOP WHISTLING. but catch them okay? because they're GOOOOOOOD. hi aria! they are weirdly better cold, i think. don't know why that is. i guess it's like the whole fried chicken on picnics thing--it's just so much better cold. Have they got a category for best adjective in a food blog, because this just won it. They're perfect like the ones I used to eat in Edinburgh! i'll take that accolade, thankyewverrrrramuch! While commuting between Edinburgh and Stirling I used to eat mini Scotch eggs on the train. As I'm now back home, I better learn how to make the proper thing myself! Santos! I have risen from the dead... actually, just been trying to get settled in Schwingalingapore, meeting up with Chubby Hubby & Kuidaore, and eating too much. In other words no good excuse. Oh yeah and I'm lazy. Must start back on my blog. 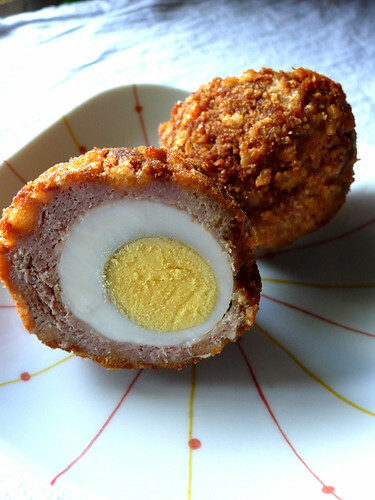 Anyhoo, love the new look and love the Scotch eggs, one of my favourite snack foods from the UK. The shrivelly ones you remember hopefully came from a petrol station and not some nice young Scot ;-)! You've got me remembering, may have to attempt them myself. I love scotch eggs, I live in the south, in Texas, so we deep fry everything anyway. The're also very salty. I never made them though. I buy them at the Houston Highland Games each year. Most Celtic festivals in the U.S. have booths selling Scotch eggs, haggis, and meat pies. I'll have to try this recipe. This is it! The recipe i have been looking for. I've tasted this kind of food which we bought from a fastfood chain. It tastes so Yummy!! Now, i can make our very own Scotch Egg. I can't wait till my next cooking...Thank you for featuring this stuff. It goes well with sweet chili sauce...Try it! Those Scotch Eggs look pretty good.